Floors are one of the first things people see when they walk into your school or university. Implementing a hard floor care program that uses superior products requiring less labor is the best way to effectively maintain your floors. 90% of a floor maintenance budget is spent on labor*. *Frumkin, Howard. Geller, Robert. Rubin, I. Leslie. Nodvin, Janice. Safe and Healthy School Environments, Oxford University Press, 2006. Print. What makes Our Floor Care Program Different? 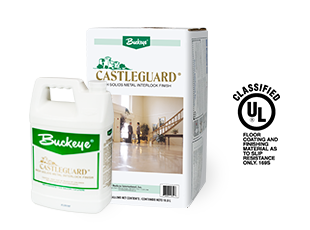 We built our Buckeye Floor Care Program on standardized procedures and the highest quality products proven to save you money by increasing efficiency and producing excellent results. No matter what floor type, equipment, or maintenance needs you have, we will help you customize the most successful floor care program for your school or university. of a floor maintenance budget is spent on labor. Floor finish protects your floors from highly abrasive soils, produces high gloss shine, and extends the life of floors. Our floor finishes are formulated with proprietary technology that never yellows or powders. 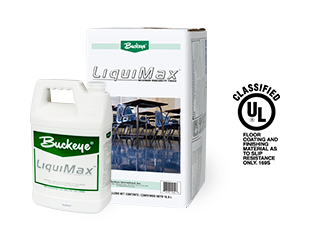 Buckeye LiquiMax is formulated to extend strip cycles to 18–36 months when following recommended procedures. LiquiMax is microabrasion resistant, and works with buff or no-buff programs. Clarion 25 builds its high gloss fast, is extremely durable, and ideal when there is limited equipment or manpower for a buffing program. 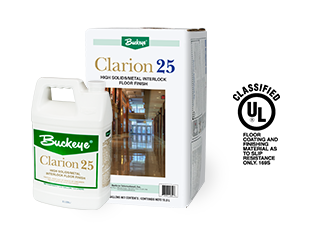 Clarion 25 is versatile and may be used on all porous floors. Citation floor finish/sealer maintains its high gloss with little maintenance required. 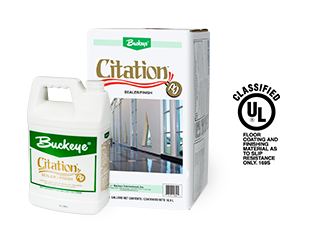 Citation resists scuffs, holds up under extreme conditions, and responds well to any burnisher. No sealer required. 1844 is non-yellowing and non-powdering with an excellent response to burnishing.1844 is self-leveling, holds up to heavy traffic, and may be applied to virtually all hard floor surfaces. Castleguard, The King of Floor Finishes™, provides a superior “wet look” depth of gloss with unmatched response to burnishing. No sealer required. Proclaim is a water-based, urethane fortified acrylic concrete floor coating that provides high gloss and fork truck durability. Our butyl-free floor strippers are formulated with patented Liquescent® technology to remove floor finish in one application without harsh odor. Maintaining your floors is effective and efficient with our non-foaming floor cleaners that don’t attack floor finish. Test us against any other Floor Program out there. We’re confident you’ll be impressed with the results. Schedule a Full-Scale Floor Demonstration today. Contact us for a floor care demonstration at your school or university.